Home For4 Sweet Home: Do You Polish? Hello you guys! I've been pinning like crazy on pinterest today! There so much inspiration out there, you should check out my pinterest boards, if you are not a follower yet. Here's my question for the day? Do you polish? Yeah, your shoes? Do you? I do. It gives me that clean, uhm well polished look, to be obvious...lol! I polished my riding boots last week & it looks so nice & shiny afterwards. 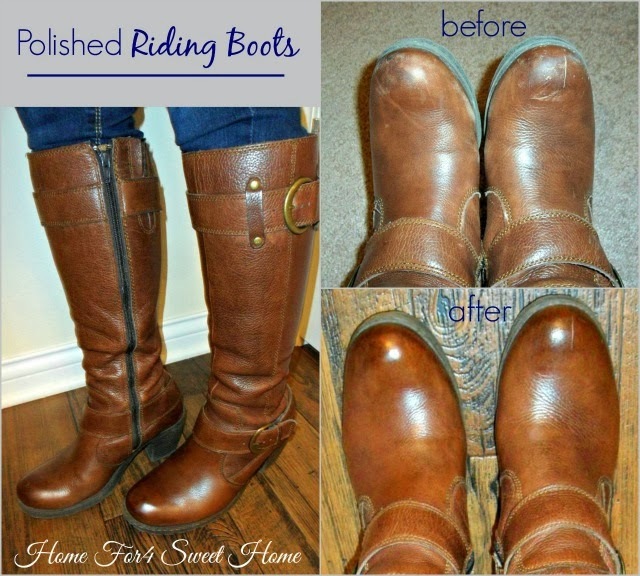 It makes the riding boots more presentable especially that I wear it almost everywhere (church, office, grocery, etc.). When I asked The Mr. what he thinks about it. He thinks otherwise though, he does not like it polished. He said it gives the shoes more character - kind of rustic & rugged feel & look to it. What about you? Do you like it polished or you're in my husband's side on this one? Don't forget to link up your latest project.